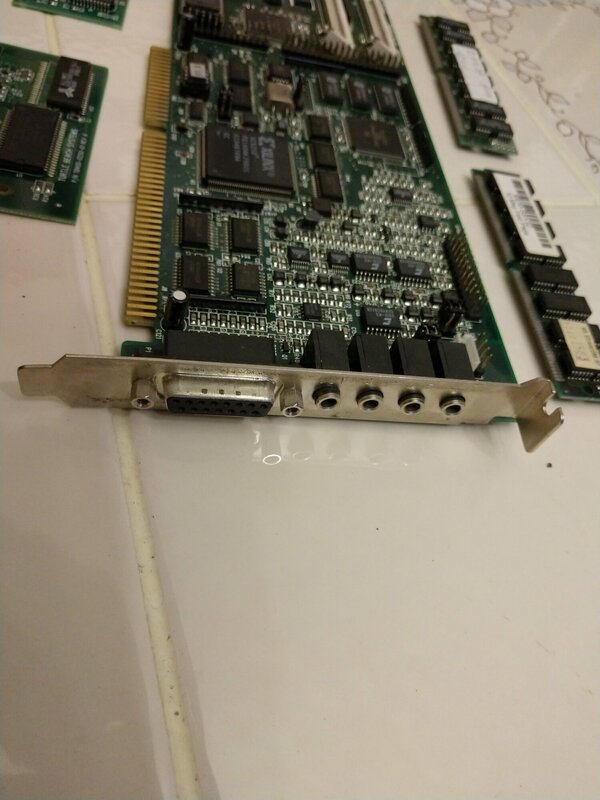 Old Sound Card... has RAM on it!? Discussion in 'Computer Audio' started by VanGoghComplex, Jan 6, 2019. Hey guys! I answered a family tech support call today to recover some files off a couple old IDE drives. His old computer had at some point in storage had the 115/230v switch nudged the wrong way and he tried to start it up. He said when he started it, the internal speaker started saying something about "improper power" and "lithium battery problem", and then the PSU let out the magic smoke. I'm kinda amazed the mobo had a voice recording in it for this kind of occasion. Anyway, I pulled this out of it as he wanted a souvenir. It was his recording studio PC for a number of years and he was visibly upset about having to let it go. This Turtle Beach sound card had to have been some kind of primo product back in the day. Two (optional?) 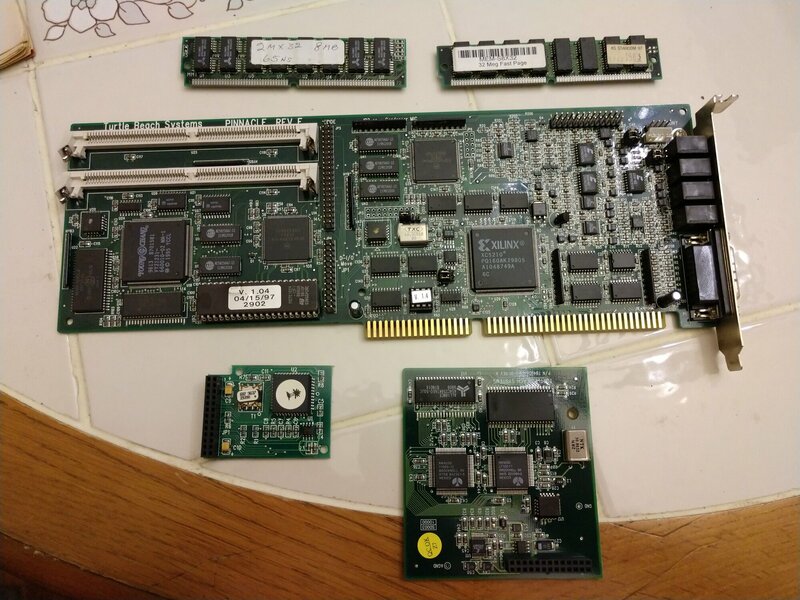 daughterboards and friggin' SODIMM slots, populated with a whopping 64mb of RAM. Mahirzukic2, Neapolitan6th, djoye and 1 other person like this. The only moderately weird part about this is that it's EDO RAM (not weird for the era) and that it's removable. My "old" Audigy2 ZS had RAM onboard, but it was just a soldered-on DDR IC. It was needed back when sound cards did more than just host the DACs. That thing's got more processors than a whole modern system. its ofr storing upgraded midi playback audio. That card and daughterboards are worth a mint on eBay. Those aren't SODIMM slots BTW.. they are 72-pin SIMM slots. Huh. I wondered if it might be worth some cash to a collector. I couldn't find any listings for one, you have any idea how much it might go for if my guy were to list it? Pretty much never see then on eBay. Guessing at least $150 or more. No comment from erek yet?? mnewxcv, GoldenTiger, pendragon1 and 1 other person like this. Oh yeah.. and if it does get listed I would very much like to be notified. OR I could buy it outright and forego the eBay and Paypal fees. Turtle Beach in my experience is non nonsense stuff. If he had that back in the day it wasnt cheap. Looking at creative labs awe32 wad last for creative labs had ram slots. Long while ago. Techincally, the CT3670, which was sold as an AWE32, is an AWE64 with SIMM slots. Those were very expensive sound cards. I had a Creative Sound Blaster AWE32 that used 30 pin SIMMS. I had a whole 4MB of RAM on it. I bought it in Costco back around 1994 and paid $500 for it. It included a X4 CD-R drive, a couple of blank discs and Mech Warrior. Very exciting times. Oh man... Optical drives that plugged directly into sound cards. I was just beginning my journey to techdom back then... Dad bought the family a Gateway 2000 in... '92, I think? Exciting times they were; 14.4k dialup was primo in our small town at that point. 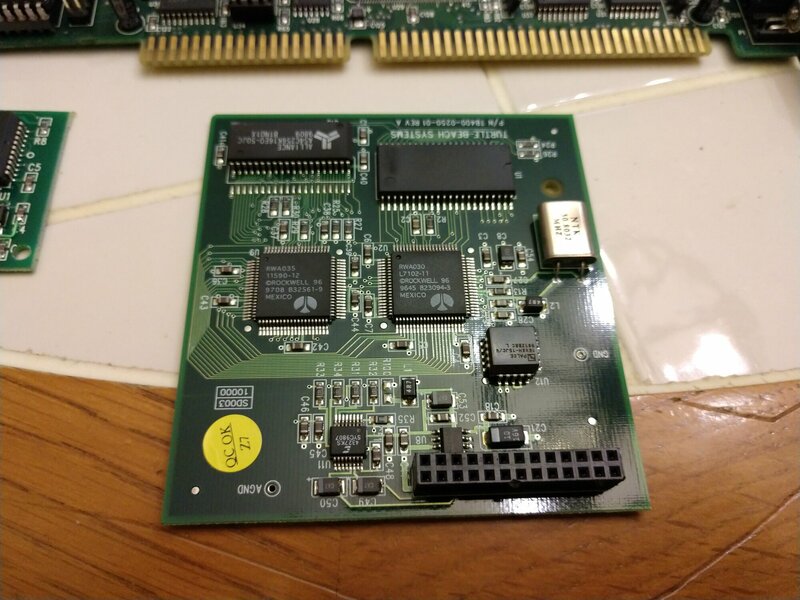 I remember the time when sound cards came with IDE controllers on them, but I can't remember why that was logical. 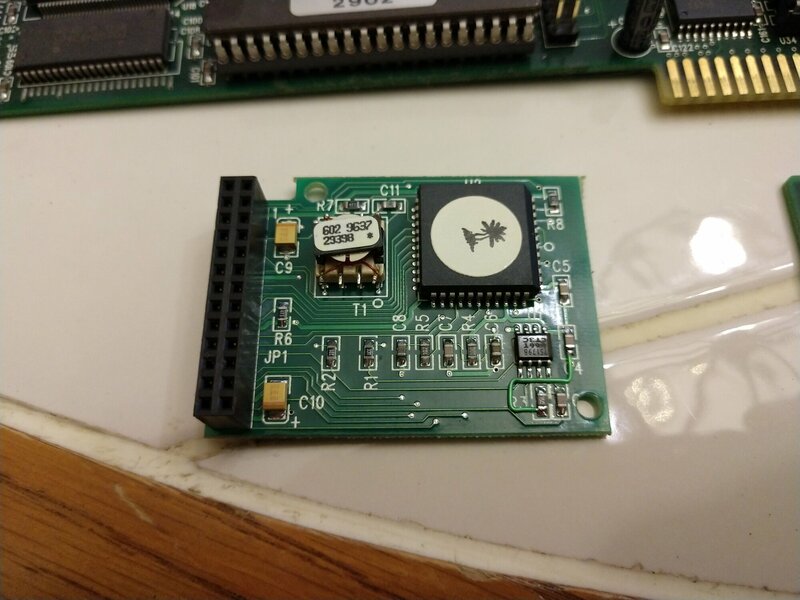 I can only assume two things, A) Might as well sell a sound card + CDROM in one package (I think I remember Creative doing this) or B) motherboards didn't support more than one device on an IDE controller. It was probably more to do with trying to share a IDE HDD and CDrom (then burners) on the same IDE channel. Buy putting a dedicated IDE channel on the soundcard, Creative probably felt that customers would get the best performance plus easier to write the instructions with no master/slave setup nonsense. I can only imagine the number of coasters being created back in the IDE days with folks putting their no burning cache CD Burners on the same IDE as their HDD. We had a external SCSI burner one back in 1998 and we had to almost rope off the PC with it on if we used it. "Don't even look at it!!!!" 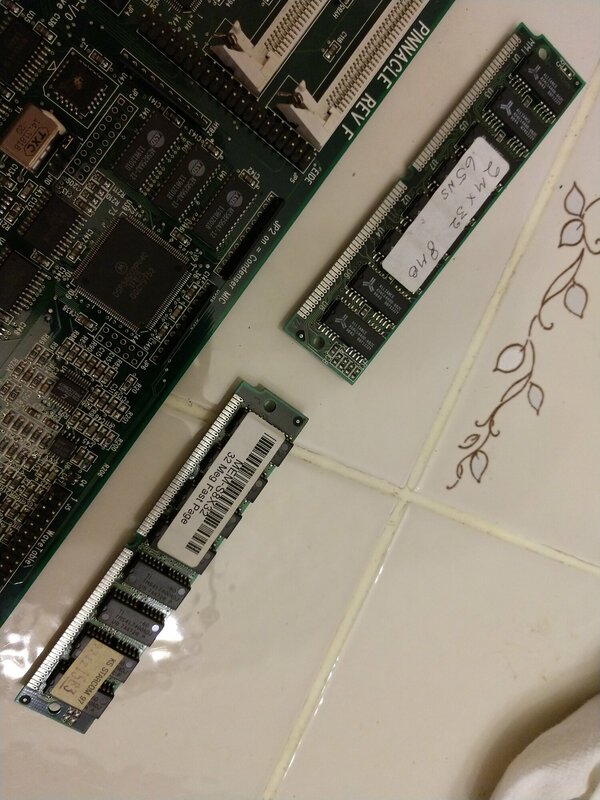 Having removable RAM slots were not crazy back in that era. You could load custom MIDI as well as pre-load the sounds on the card and could use the sound card co-processors for real time effects, etc. There were several sound cards that had that. Almost all of them also had IDE/EIDE as well as other ports for things like CD-ROM's etc. Your card has one.. Again, this too was standard stuff..
Usually too a rotary volume control on the backplate was a sign of serious output.